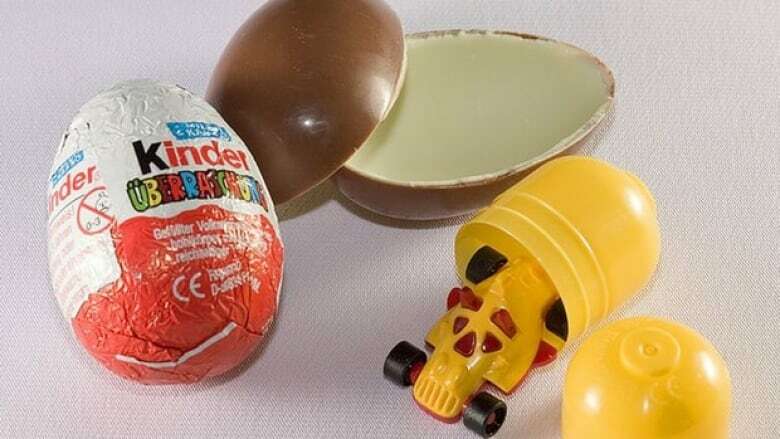 Two Seattle men returning home from Vancouver were detained by U.S. border agents because the Kinder Eggs the men bought in Canada are banned in the U.S. as the plastic toys in the eggs could present a choking hazard to children. Two Seattle men say they spent more than two hours in a detention center at the Canadian border after U.S. border agents discovered illegal chocolate eggs in their car. Brandon Loo and Christopher Sweeney told Seattle's KOMO-TV they decided to bring home some treats for friends and family during a recent trip to Vancouver. They bought Kinder Eggs — chocolate eggs with a toy inside. The two men say border guards searched their car and said the eggs are illegal in the United States because young children could choke on the small plastic toys. Importing them can lead to a potentially hefty fine. Sweeney says the bust was a waste of his time and the agents' time. The men eventually got off with a warning. A U.S. Customs and Border Protection spokesman declined to comment about the case Tuesday night. The agency warned on its website around Easter that the treats can't be imported legally. The agency says it seized more than 60,000 Kinder Eggs from travelers' baggage and international mail shipments in fiscal 2011, which was more than twice the amount seized in the previous year.